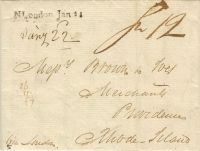 Stampless folded letter re Preliminary Peace signing in London. Datelined Cowes Ile of Wight November 11th 1801. On reverse "forwarded P.T.D. & Co./ 17 Non. 1801" Sailed from Falmouth on the Bark Belfast, Captain Waterman, 12 Dec. and arrived at New London 21 January 1802. Handstamped straightline "N London" (21x4mm) townmark with manuscript Sh12 rate for 40 to 90 miles: 10 cents plus additional ship fee of 2 cents.